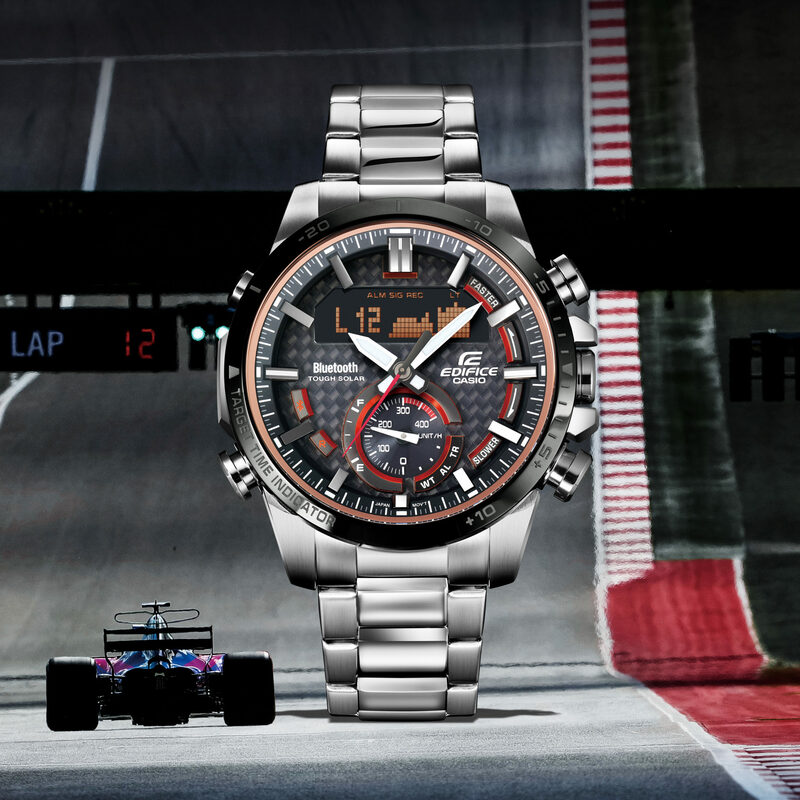 Home Brands Casio Casio Edifice ECB800DB-1A is motorsport-inspired but can it keep up? Casio produces a bunch of lines of watches, all aimed at different segments of the market. The Edifice line is Casio’s mens line, aimed at mid-range, activity and vibe-inspired looks. They’re typically not too pricey, feature stylistic flairs, and add in a bit of new technology. The creatively named ECB800DB-1A is a motosport inspired design, with looks that stand out with race-inspired design. Inspired by elements found in motorsports such as speed, intelligence, and innovation, this smartly-designed men’s watch offers a bold design and enhanced timekeeping capabilities through smartphone connectivity. This thing is big, shiny, and has very bold features. I’m immediately struck by the large subguage at the 6oclock position, with interesting markings for apparently speed and.. is that.. a fuel gauge? Or perhaps a solar charging battery meter? The black LCD display looks interesting with its cutoff top corners. Activating the light.. it’s shiny! There appears to be a white LED behind the LCD, and a white LED shining brightly onto the analog face of the watch. The lighting works, but there’s a ton of glare. The metal bracelet.. shiny, and hollow. Once sized, the ECB800DB-1A metal bracelet fits just fine. The clasp of the bracelet is a single locking design, and the bracelet appears to be hollow. It looks nice and shiny on first glance, but as I was handling it to size it, and wearing it, it becomes apparent that this bracelet is hollow, fairly lightweight, and maybe not the most solid. It generally works and fits the watch, but it’s only as good as a glance. The watch is big and bold – the chunky chromed pushes stick out a bit, and in wearing the watch you’re certainly making a statement. I haven’t always been the biggest fan of analog/digital hybrids, but in wearing this watch for a week, I appreciated the easy legibility of the LCD, and the quick glances of the analog hands. The carbon fiber texture of the face does give it the motorsport aesthetic, and I’m sure if I was “down at the track” it would blend in just fine. Black ion plated bezel – Dark and shiny, but picks up fingerprints fast. Stainless Steel Band – Hollow, but shiny and fitting with the style of the watch. Solar powered – I LOVE solar powered for electronic watches. Now that solar power can be essentially hidden behind the printed face, I think all electronic watches should have this. It seems to work well. LED light for the face – Yikes – what glare! This is just a small square LED positioned at the 7oclock position on the edge of the face, which glares across the face of the watch. Sure, it illuminates the hands, but there’s so much glare, it’s almost unusable. Way too bright, way too much glare. Additionally, that raw LED is not covered up or hidden.. just a big yellow chunk of LED sitting there. This could be done much better. LED backlight for the digital display . Yep, it works, but the white led illumination is not anywhere near as even as an EL backlight. Additionally, the LED shows off the rough edges of the LCD display. Kinda unpolished. Mobile link (Wireless linking using Bluetooth®) – It works, and pairs with my smartphone. But the utility of the app is marginal, and not very well thought out. Not super user friendly, and seems to value style and looking technical over actually being usable. Of particular note, the keyboard that’s used for naming alarms is a proprietary in-app keyboard that barley works, NOT the native iOS iPhone keyboard which is usually presented for typing in apps. I’ve never seen an iOS app use a proprietary keyboard instead of apple’s native iOS keyboard.. how is this even acceptable on the app store? World time – Works, and shows the city. Target Time alarm – Yep, i suppose if you were a motosport spectator? But if you’re a racecar driver, you’re never actually going to use this to time your laps. Button operation tone on/off – Yes, glad they have this. Power Saving (display goes blank and hands stop to save power when the watch is left in the dark) – Cool feature, but am i really going that long without seeing the sun? I hope not. Regular timekeeping – It works! Who we think it might be for: Motorsport enthusiast looking for their first themed watch, who wants some nifty features to show friends, but who will actually use the watch as a daily beater. If I could make one design suggestion, it would be: Fix the backlight to eliminate all of the glare, and finish the integration of the LCD Module to hide the edges better. Improve the app look and functionality – get rid of that non native keyboard, make the app actually easy to use. There’s so much more you can do with an LCD display on a watch and a bluetooth link – unleash it all! What spoke to me the most about this watch: I appreciate they’re going for a somewhat accessibly priced theme watch, with looks good enough for a construction site boardroom, solar power, and minor bluetooth features. Wrist Watch Review Writer Jeffrey Donenfeld lives in Colorado and reviews products at his website. An accomplished adventure traveler, antarctic expedition director, and rescue scuba diver, Jeffrey has tested and reviewed watches in a multitude of challenging environments. Jeffrey loves exploring design, construction, materials, and utility aspects of horology, and gets a kick out of both classics as well as fresh new ideas. He typically tests extensively watches he writes about, and provides readers with a real-world, practical take on diverse timepieces. In addition to writing about time, Jeffrey also works as a venture capital investment manager at a growing startup accelerator in Boulder, Colorado. In his free time he travels (70+ countries and counting), snowboards, rock climbs, runs, sails, scuba dives, and occasionally relaxes.